Last night in Peachtree City, Georgia, I got to sit in the backseat of a VW Phaeton—the cheapest Bentley I've ever seen—for the first time. That pleased my inner automotive cheapskate. We served pizza and beers to Jalopnik and Gizmodo readers, showed clips from our new TV show, and debated the future legality of commercial drone flights. And that was before we even had the 2013 SRT Viper GTS in hand, since Jalopnik's Travis Okulski was bringing it back from the NASCAR Hall of Fame, where we'd left him when the drop-off from SRT was a little late since they hit weather. If we made a Top Gear for gadgets, would you watch it? In two weeks, you&apos;ll have your chance. 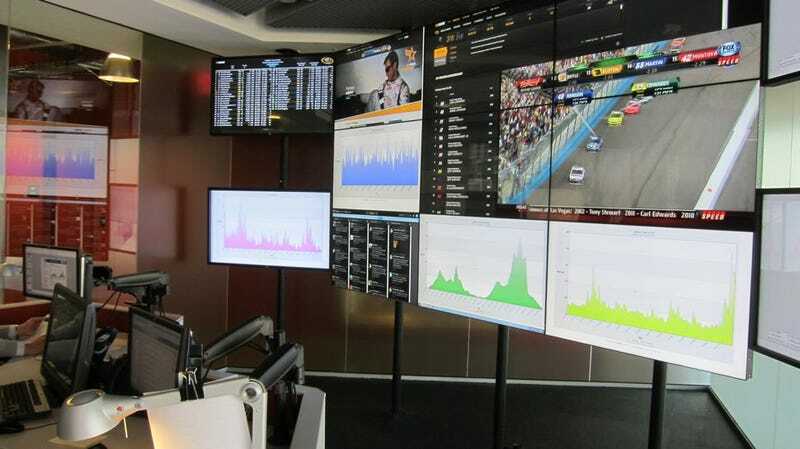 One more thing about that NASCAR control booth: What's gonna happen when Twitter shutters Tweetdeck? Here's yet another example of people spending tons of money using Twitter as a tool for their business while Twitter (the company) simultaneously shutters their professional-grade tools. Silly. We're on to Houston, Texas tonight for another #SRTxSW meetup with the Jalopnik crew at The Cellar Bar at 7:00 PM (look for the white Grand Cherokee and red Viper outside). Let us buy you a beer while we show you our fancy borrowed cars and show you some clips of the show before it premieres on Monday, March 18th at 10:20PM on BBC America after the season finale of Top Gear.